Max Guests: Form one guest up to 5 guests traveling together. Other: Private flat. Pool. Playroom. Pets welcome. Immerse in the French language and culture in the heart of “The Beaujolais” region, not far from Mâcon and Lyon. 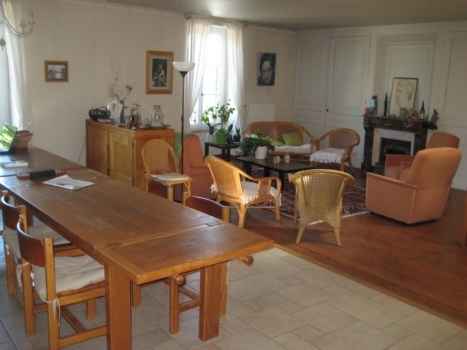 French teacher Marion will welcome you and your family/friends in your own flat in her countryside family house. This is wonderful and sunny region of France, known for its lovely wines. Enjoy a glass by the pool and practice your French in this calm and serene atmosphere. My name is Marion and I’m a 28 years old native Frenchwoman. Although I’m quite young, I’ve been teaching French for a while: I’ve worked for 3 years in the Alliance Française in Jersey (Channel Islands) and before that, the Alliance Française of Dar-Es-Salaam in Tanzania and I have a DAEFLE degree (diploma for teaching French as a second language). Traveling is my passion: I’ve lived in Mexico, Portugal, Tanzania and Jersey, and therefore I’m fluent in English and Spanish. I specialize in teaching French to adults of all level, focusing on oral skills as I think speaking and listening are the main objectives of most students. It is also important for me that you feel confident and that you take pleasure in the learning process. The lessons will be tailored to your needs, often using games, fun activities, videos and radio/podcasts. In my spare time, I do sports: I run in the countryside around my house and I sometimes go swimming. I also enjoy reading and gardening, hiking or any outside activities. And I love food and wine! My house is located in the Beaujolais region, in a tinyl and peaceful village near Mâcon (on the Rhône valley, not far from Lyon). It’s big L shape house, with a large garden and private swimming pool. My mother – who is retired – and my brother also live in the house. It’s big enough that we all have our own independent living corners and lives, however my family loves having guests and when they are around, my Mom and brother will be happy to help you practice your French. You’ll have your own flat in the courtyard of the house, on the garden level. 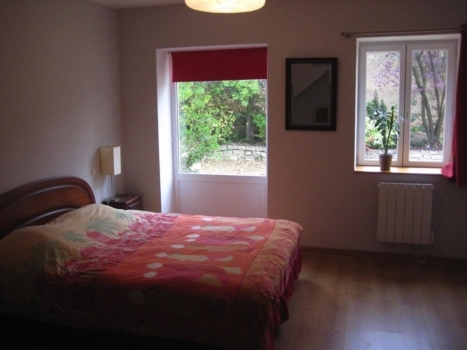 It’s bright, quiet and very private and was renovated just 2 years ago. You are welcome alone, or with your spouse, a friend, or your whole family! Your flat can accommodate 4 to 5 people: 2 in the master bedroom and 2 on the sofa bed in the lounge, and extra bed could be added for a child. Here is how the entrance looks like: your flat is on the garden level. There is a large bedroom with a king size bed. The lounge has the afternoon sun and opens to the outdoors. It’s warm and cosy and has a sofa bed which sleeps two, and a nice dining table. The kitchen is fully equipped and has a small table. 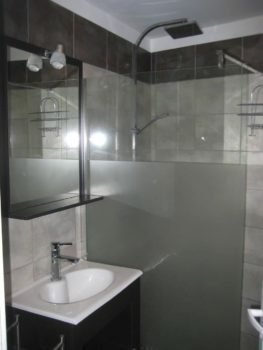 Of course, there is also a nice bathroom with a shower and a separate toilet. 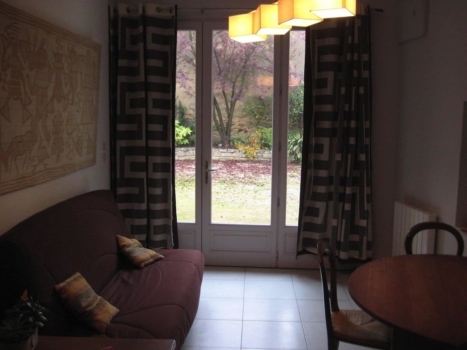 This student apartment is part of our house, where you are also welcomed to hang-out. In summer we eat on the terrace, it’s my favorite place of the house. Over the student’s apartment, there is a large unfinished space we use as a game room in the summer, with a pool table, ping-pong, and table football – it’s a great space if you are traveling with kids! We have two cats and also have chicken which means fresh eggs every day! We also have an organic garden for fresh vegetables and fruits. 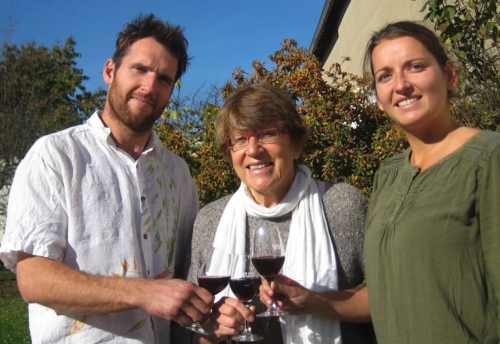 Living in the heart of the Beaujolais vineyard, my family and I have a passion: natural wine and we’ll be delighted to share it with you if you’d like. Vineyards are simply all around us, and wine tastings can easily be arranged with local winemakers. You may also like to visit the “Hameau du Duboeuf” the first theme park for viticulture and wine. Because my house is located in a tiny village in the countryside, I recommend you rent a car if you’d like to travel around. We love animals so you are welcome to come with a well-behaved, well groomed dog or cat (please note we already have two cats, and an open swimming pool). There is Wifi connexion in the house. I enjoy smoking a cigarette from time to time but only do so outside. Smoking is not allowed inside. The Price With These Options Is 1300 Euros for one person. Euros 700 with shared lessons and excursions. You are welcome to come alone, or with your spouse, a friend, or your whole family! Your flat can accommodate 4 to 5 people: 2 in the master bedroom and 2 on the sofa bed in the lounge, and extra bed could be added for a child. We are a very laid-back family. We enjoy hanging around the pool or on the terrace, reading a nice book, gardening or playing some games in the game room. We are good hearted people and our lifestyle reflects it. The house being very large, there is really enough room for everybody and you could be more or less independent or involved in our everyday lives, according to your own life-style. You’ll love this region for sure – there is so much to do and see around here. Not not mention the fresh produce and French culinary delights, and of course… the wine! I am looking forward to welcoming you in our house, and introducing you to my family: we’ll gently encourage you to speak French and help you discover everything the Beaujolais has to offer. Click here to read the articles Marion wrote about her region for the French Today blog. Merveilleux! Inoubliable! Only these French superlatives can convey how pleased I am with the two weeks I spent with Marion. I have studied in two other French immersion programs. I can attest that Marion’s was by far the most enjoyable and productive. Everything was perfect: the classic village of Lancié in the heart of the Beaujolais; the very private, spacious, and fully equipped accommodations. But most of all the disciplined professionalism and energy with which Marion undertook to took work on my weaknesses, as well as her truly sympa, friendly, and engaging personality. What was truly special about the program was that every morning, just after breakfast, we would head out together for a brisk one hour walk through the lanes of the village, along the roads leading to the vineyards, and then through the fields themselves. All the while we would converse in French, often in great depth, on a variety of topics according to Marion’s structured format. While correcting my errors in grammar and usage, and providing new vocabulary, she would enter the corrections in her cellphone and later email this “homework” to me for study. I must also mention what a pleasure it was during breakfast and lunch sharing conversation about France and the world with Marion’s exceptionally engaging mother. I regret not taking a photo of mother-daughter together, but plan to do so next year. French Today students are truly fortunate to have a chance to study with Marion. Immersion with Marion in the small village of Lancie was beyond my expectations. 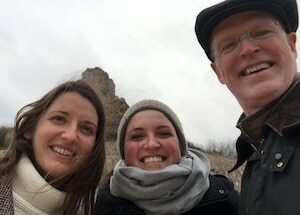 Being a part of a family-immersed in the French language and culture, in a casual atmosphere was the highlight of my trip! The family is warm, hospitable and friendly. Marion welcomes you with an open heart, as does her Mother, Nicole and brother. We walked most mornings to the tiny market of local foods for fresh breads and other delicacies. We’d all breakfast together and enjoy the start of country day, discussing “the whatevers” of course all in French. We would then explore the area, somewhere different each day (through the vineyards, along the river…), on foot talking of current events, points of view on controversial topics, defending our ideas…Marion would correct our French, as a parent would, so that the conversation would still flow. There were three of us, yet Marion would remember our individual weaknesses and when we returned home, we would go over these mistakes and learn quickly to correct them. My French improved immensely and my confidence of speaking grew as well as my fluidity. 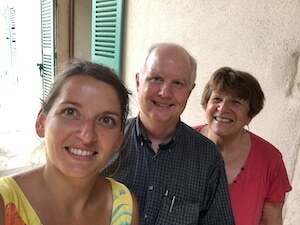 My wife and I spent a week with Marion in Lancié, although I was the only one studying French. This was my third immersion experience in three weeks, and it was everything that I hoped that it would be. 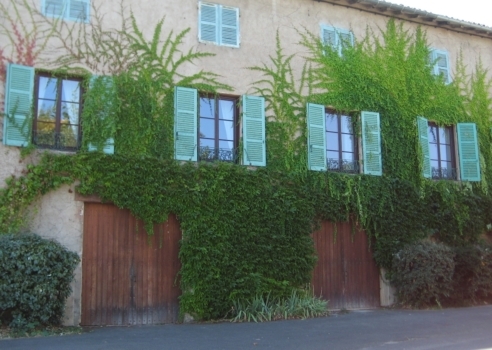 Lancié in a small village in the Beaujolais region. My other immersion experiences were in more populated regions. It was a nice relaxing change to spend a week in the country, with chickens and fresh figs in the backyard. The nearest sizeable city is Macon, about 30 minutes away. I recommend having a car if you want to go somewhere after lessons and lunch. Marion is a wonderful teacher. Despite her young age she has traveled extensively and can draw from a large array of experiences. I am 70 and Marion and I communicated very well. After a delicious French breakfast we had a 3-hour lesson. As other reviews described we had three hours of great conversations on a wide variety of topics and we played games (I’m not a game guy, and I really enjoyed playing Taboo in French). After the lesson Marion made a wonderful lunch, including Beaujolais wine. So, from 8:30 to about 1:00 it was nonstop French. During some meals, Marion’s mother and friends joined us. It was a delight meeting and talking to other very interesting people. One evening two other friends dropped by, and I was able to converse with them. We went on excursions to the medieval village of Pérouge, and Marion and I walked up a mountain path to reach a point high above the valley. It had a fantastic view. I learned that some French actually do drink box wines. My wife and I visited Macon twice (there is a very nice pedestrian shopping area) and had lunch in a lovely local restaurant just 1 mile away from Marion. My listening and speaking skills improved significantly. I would absolutely recommend Myriam to a friend or come back myself for another week. When we left Lancié we drove to Paris where we spent 4 nights. I felt pretty confident talking French in Paris and only a few people switched to English. 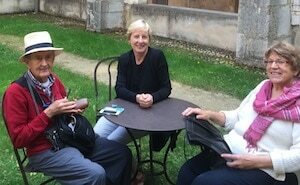 I traveled from Australia to France with the express purpose of trying to improve my French conversational skills. A week spent with Marion certainly helped me along that path and there were bonuses which made this a most memorable adventure. I had my comfortable apartment to which I could retire as I wished and where I could cook an evening meal; however, most of my days were spent in the Marion’s company and therefore with the opportunity to converse in French. Breakfast and the midday meal were very tasty and often contained products from the garden – and from the hens. The morning “lesson” was relaxed and basically was a conversation on a range of topics, with Marion correcting my grammatical errors and supplying vocabulary where necessary. And there were word games which were fun. The weather was perfect, hence we were able to spend this time strolling near vineyards or around the village. A sensational excursion was to La Roche Solutré. Google it and you will get a sense of its special nature. 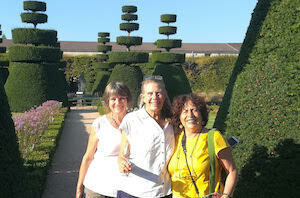 I now have valued French friends – Marion and her mother Nicole. They are both people for whom I have great respect and it is my hope that next year I may be able to spend time with them again. 1. Do you like having fun? 2. Do you want to eat bomb food every day? If you answered “no” to any of these, I have many follow up questions for you. If you’re a human and want to improve your French, then this is the place for you! Marion and her Mom Nicole were the best! 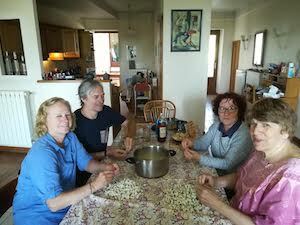 They made me meals with vegetables from the garden and we even had jams Nicole made from their fruit trees. Fresh tomatoes, lettuce, carrots, beets, and meat from local farmers. Ah-mazing! Oh. I almost forgot. You also learn a ton of French here in a comfortable environment with games, comprehension lessons, and homework (if you want it). Marion is super great to talk to about anything and she really cares about helping you learn what you want to learn. Some of my favorite moments from the week were just chatting in French with Marion and Nicole during meals. I’m so happy I did this immersion stay. It will be one of those life experiences I’ll never forget. P.S. Beaujolais is beautiful and stuff, but you probably already knew that. My husband and I spent the most wonderful week in Lancie with Marion for our first experience of a French immersion program. It could not have been better with Marion’s kind support, encouragement, and relaxed and fun approach to learning French. 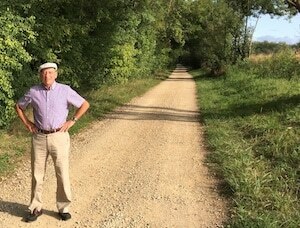 Walking in the Beaujolais vineyards while conversing in French had a magical effect of feeling connected to both the language and the land. We both gained confidence in our ability to speak to French and we look forward to our return for more! 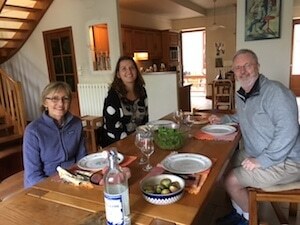 Our gite accommodation was spacious and lovely and our daily meals with Marion were hearty, healthy, and delicious. Marion does NOT disappoint as host, “prof extraordinaire” and friend. Thank you so much for this wonderful week in beautiful Bourgogne! My week with Marion was excellent. When I arrived at her house, her mother, Nicole, had guests visiting. They made me feel very welcome, but of course, were speaking rapid French. Marion didn’t let me get too lost, so after a few minutes she showed me around, and explained her methods. Unfortunately, the first few days we had rainy, cold weather and we spent our time in front of the fire rather than walking through the vineyards. However, the fire was warm and inviting and it was not a hardship to be inside. The activities and games we played were great to get me relaxed and speaking without too much trouble. I had been speaking French the week before in another immersion home, so I was not as timid about speaking. However, Marion is so easy to be with that she would have made me feel comfortable quickly, even if I had just arrived in a French speaking country. The activities helped break the ice and learn about each other a bit. The game “taboo” was lots of fun, especially when the words were “false friends.” Some I quickly figured out did not mean in French what they mean in English, because of the list of forbidden words. Others just turned out to be very humorous as I explained something totally different, yet somehow Marion was able to come up with the word. 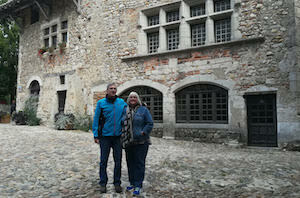 Our first excursions was to the Medieval walled village of Pérouges. It was amazing with it’s tree planted before the French Revolution and old buildings. We stopped in for a drink and dessert, both “creations” of the establishment, at the hostellerie. The 2nd outing was to the Church of Notre Dame in Avenas. It was built in the 1200s and was in amazing shape. We happened to arrive at the same time that a history professor was talking about the limestone altar to a group of fellow hikers. The altar still had incredible detail and it was hard to believe it was so ancient! 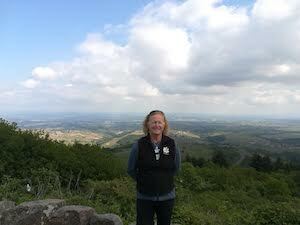 Afterwards, a hike and an amazing view of the valley where most all the Beaujolais vineyards are located. The meals with Marion and her family were so delicious. Marion is an excellent cook, as is her mother. I really enjoyed mealtimes and the lively discussions. I was able to follow some of the conversations and at least knew the topic of conversation as well as several points that had been made. Marion did a great job catching me up on the information when it was obvious that I was lost. Her brother, mother and all their friends were so gracious and welcoming. I learned to play a card game with them, but the dice game I’m not sure that I would understand even if it was explained in English! The apartment was very large and I could have brought my whole family to stay with me When the sun arrived, I loved walking in the yard. I was very sorry to leave when my week was over. I felt that I had made good progress, but there is so much more to learn! 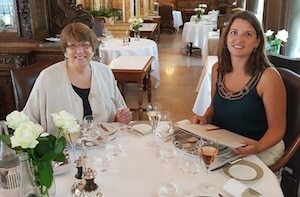 My daughter and I spent a week at Marion’s, and we thoroughly enjoyed ourselves. The quality of instruction provided by Marion was simply outstanding. Marion and her mother were so very hospitable and welcoming throughout. The conversations we had together over coffee and meals were extremely pleasant, relaxed and informative. The excursions we took together were absolutely delightful. Marion’s enthusiasm for teaching others the French language and about French culture was truly infectious, and we benefitted greatly from Marion’s considerable teaching experience. Ever patient, she discerned exactly what our respective areas for improvement were, and our French speaking abilities improved markedly as a result. She also has an innate ability to offer simple explanations in clarifying complicated points of French grammar. In our case, Marion’s command of multiple other Romance languages enabled her to bridge gaps between French and other languages we speak. 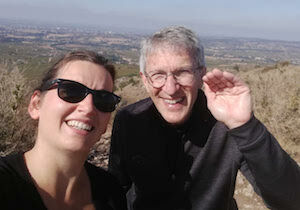 This was a fabulous opportunity for a father and daughter to reconnect. I’d like to return to study French with Marion and intend to bring my wife on my next trip. I can’t say enough about Marion’s overall professionalism and pleasantness. We had a blast! My wife, Denise, and I spent the last week in March with Marion and her Mom, Nicole. We had decided that we needed help with our French; I much more than Denise. 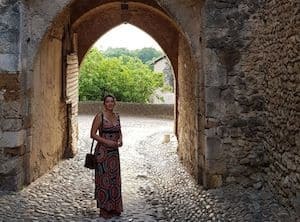 We looked at many different immersion course options but decided that the course offered by Marion in a quiet village in the heart of Beaujolais would meet our needs most closely, and it did. 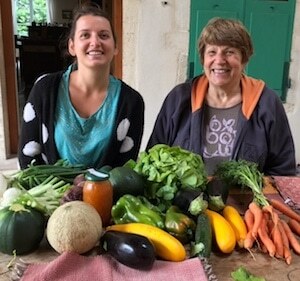 Marion managed our two very different capabilities very well and with the help of her charming mother, Nicole, not only improved our French but gave us an excellent taste of French country living. 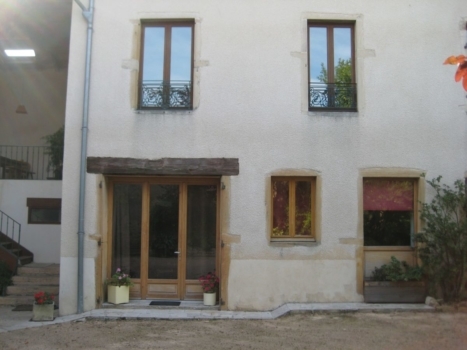 The village is small and quiet but very centrally placed and nearby the A6 autoroute as well as the TGV line connecting Paris with the south. All the world famous Beaujolais villages are within single figure kilomètres, and Lyon is well less than an hour’s drive away. The accommodation is very comfortable and how many hotels offer rooms where chickens deliver fresh eggs outside the door each morning. Altogether a very useful and a very enjoyable experience. 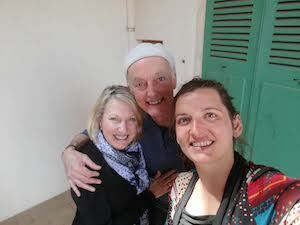 My husband and I spent a wonderful week in Lancié with Marion. Although it was only me who undertook the immersion course, my husband was very happy looking after himself in the spacious accommodation provided. I have been learning French for some years but wanted to improve my conversational skills and vocabulary and I was really happy how Marion was able to structure the course for me. 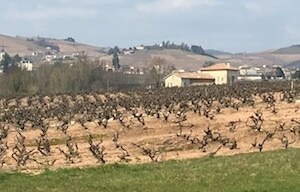 Each morning after a delicious and filling breakfast, we began with a walk either in the vineyards around the village or along the banks of the nearby Saône River. We walked and talked usually on a specific topic and then we played a game designed to increase and test my vocabulary. We returned to Lancié to focus on some grammar and then listening to a YouTube video (in French, of course). I found this quite challenging, but I wanted to be challenged and it was a good way to hear other people speaking French. On that note, Marion’s house was full of people coming and going. She and her family were wonderful hosts sharing their interests, friendships, food and laughter. I can highly recommend studying with Marion. You will not be disappointed. My husband and I had a fantastic week with Marion and her mother Nicole. My French was not strong when I arrived and I was a bit nervous about managing for a week. It had been three years since I took formal lessons and I had only worked my way through Levels 1 and 2 of French Today audio books course. I need not have worried – Marion was the perfect teacher for my level and I was amazed at how much we managed to converse and the wide variety of topics discussed during our morning walks (which I loved). This was such a wonderful way to improve my French. Marion and Nicole were also very flexible, including my husband at meal times and on excursions by speaking English, so that he also enjoyed the week. I have already booked in to return next year and feel much more committed to practising each day. We loved having our own apartment and being able to join the family for breakfast and lunch (always delicious with fresh produce from the garden), visiting the local market and shopping for our dinner supplies. Lesson time in the morning flew and was an excellent balance of conversation, expanding vocabulary and improving understanding of grammar. My priority goal was to improve in speaking and understanding and this was achieved, though of course I still have a long way to go. We left feeling like we had made new friends and loaded up with Nicole’s fabulous confitures and biscuits. Merci, Marion, tu es vraiment formidable!! I would highly recommend Marion for a French Immersion Course. I am at a very, very basic level and having done approximately 30 hours of lessons prior to staying with Marion I was not really able to put more than a few words together. My teacher from home had concentrated a lot on grammar, which I understand we need to know however it didn’t really help with speaking to people. 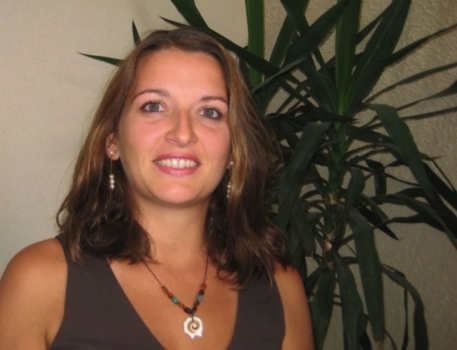 Marion has a very relaxed approach and easy way of teaching. She had me speaking in sentences before I knew what I was doing which helped me get my confidence up a lot. I have since felt comfortable to order at restaurants, shop at the markets and make reservations on the phone. I am sure that I am not always completely accurate but it is enough that people understand and I have even found them responding back to me in French when they used to revert to English after my French attempts! You will be made to feel incredibly welcome at Marion’s home by her and her Mum (her brother was away for my stay). The conversation is free flowing, the food delicious and there are many things to do around the area if you choose not to have too much homework. 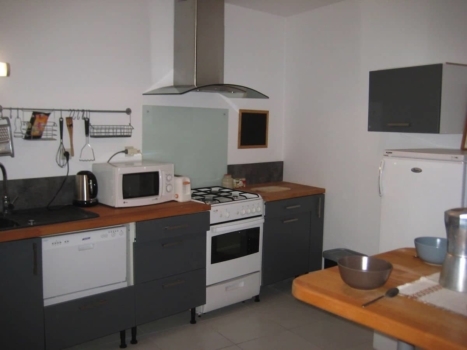 The accommodation is exactly as described and fully self contained. Overall it was a fabulous experience and one I hope to have again as soon as I can manage to get back and visit again. After seven or eight years of French study in the USA (initially with Camille at her home in Medford, Massachusetts before she returned to France), and a delightful two-week visit to the North of France in the summer of 2016, I decided that the time had come to step up the game with an immersion stay in 2017. The choice I made, Marion’s program in the Beaujolais region, was absolutely the right one for me. A lover of the countryside, I found the rural setting relaxing and conducive to study. More importantly, Marion’s instruction was truly expert as well as enjoyable, reflecting her years of experience teaching French on the Channel Island of Jersey. 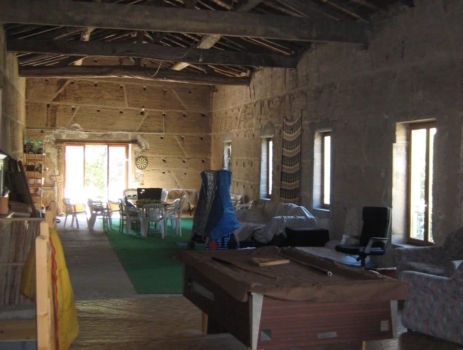 We had daily classes in the family’s lovely and spacious stone farmhouse. Several mornings, we took our lessons outside for long walks along the canal path by the Saone River where the time went all too quickly. The accommodations in the student apartment were generous and comfortable. Although France was experiencing “la canicule,” or a heat wave, at the time, the apartment underneath the house remained naturally cool and comfortable without the need for air conditioning. With the backyard pool to cool off in, the heat was no problem. During my “off” time, I took every opportunity to explore the countryside. 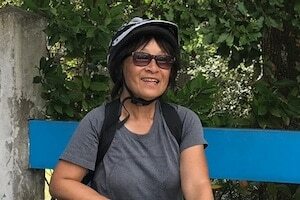 Borrowing Marion’s bike, I climbed the surrounding hillsides, then took great pleasure in speeding back downhill through the vineyards to the charming little village of Lancié. The cycling highlight was a strenuous climb up neighboring Mt. Brouilly where I enjoyed a panoramic view of the local countryside, a picnic of French bread, ham and cheese, and a spectacular sunset. The daily breakfast and dinners prepared by Marion and her delightful mother Nicole, were delicious, and the good conversation was a pleasure as well as educational. Fresh eggs from the hen house for breakfast were the perfect finishing touch! My only regret is that just a week was not long enough – I hope someday to make a longer stay – but that week was truly special, and I recommend an immersion stay with Marion to all. 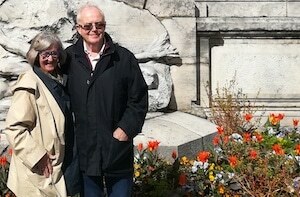 Our week with Marion was part of a nine week holiday through Europe. 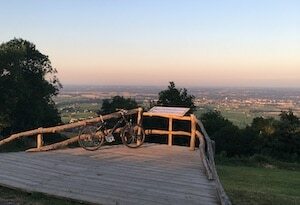 We arranged it with a view to trying something very different in a part of France we wouldn’t normally visit for much more than a drive through. One of us had lived in France for two months previously, the other had only learnt French through apps and books. Both of us thought it was the best week of our holiday. The immersion had all the parts described on the website – breakfasts and other meals, day tours, a private residence and of course the lessons – but what we hadn’t counted on was just how welcome we were made to feel by Marion and her family. It’s a special ability to make two people with limited French feel comfortable and engaged as they try to speak French and nothing but French for a full week. Marion has that ability in spades. If you’re considering doing an immersion with Marion, just do it. 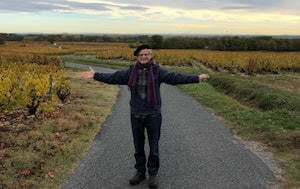 You’ll both have the quintessential French experience of living in a wine making village with lovely people who talk each morning about politics, food and wine, all the while learning from an incredible teacher. There’s a good chance we’ll be coming over to Europe again next year, and if that happens we have every intention of doing it all again. Merci, Marion! 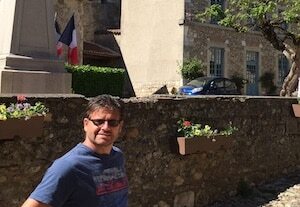 I thoroughly enjoyed my week in Beaujolais.I love the region – and the accommodation, the food, the wine and particularly the company were all excellent! I have been trying to improve my french for such a long time but I felt that I made real progress after my week with Marion. She made me feel at ease and learning french and conversing reasonably well in the beautiful countryside was a great pleasure. Marion’s use of games and introducing me to her friends also helped my confidence -so did talking with her mother Nicole who was always courteous and attentive. Thank you Marion and Nicole for your welcome, for looking after me so well and for reinforcing my love of France and the French language!! My stay with Marion was perfect. In the beginning, I wrote to Marion telling her that I mainly wanted to be with a French person/family in order to experience French culture, food, wine, etc. – the total living experience – but not too much of the French lessons and studying. I told her that I was not a serious French student and didn’t like to do homework. And I was on vacation and retired after all!! Marion was ok with what I wrote her, saying that the immersion course is custom made for each person as was the starting time in the morning! The immersion course should be enjoyable she said. I went from wanting just the minimum amount of lesson time a day to wanting as much French lesson time that was offered. 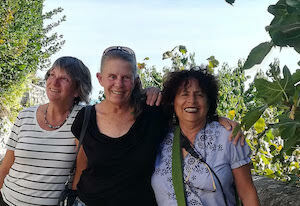 Marion made learning French and speaking so fun and enjoyable – besides getting in beautiful walks around the area along the river or overlooking the vineyards at the top of the hills. 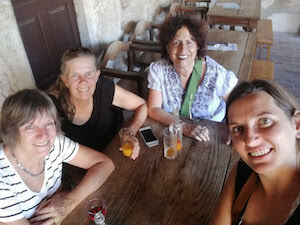 I loved playing Taboo and walking, speaking and learning French with Marion. She makes you feel so comfortable and at ease. The food and meals were wonderful. I liked that Marion serves mostly local, organic food and every morning you can have her chickens’ freshly laid eggs as part of the generous breakfast besides miscellaneous home made confiture. I enjoyed learning about and drinking natural wines that Marion had for us to drink. I’m sorry I left the day before her friends and family bottled their barrel of wine. Marion has a bike available for anyone who likes to bike ride. I was able to go on a couple of bikes rides around the vineyards and to Fleurie, the next village above Marion’s village. There was a lot to see on the various excursions available nearby. There are two of the “Most Beautiful Villages of France” nearby – Pérouges and Oingt. We went to a few local marchés where we bought some cheese and bought more local produce besides what Marion was growing in her large garden. I had wanted to see a little part of the northern part of the Côtes du Rhône (Côte-Rôtie) vineyard area since I love the white wines grown there and the vineyards are on steep hillsides with rock wall terraces. Marion was very nice to drive such a long distance to satisfy my wish. 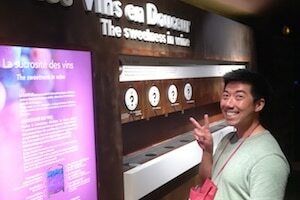 One day I walked to the Hameau du Duboeuf and enjoyed the wine museum/theme park. Like the brochure says – for the novice or expert. Marion’s mom was so nice to me when it was time to leave. She drove me to the TGV train station on her way to buy some famous chickens from Bourg-en-Bresse (where Marion’s mom was born too). My train was late and she insisted on parking the car, walking me to the train platform and waiting until the train arrived. This is the kind of hospitality Marion and her family give to their language students. I also enjoyed seeing the two cats, Tarzan and Lillie, every morning during my stay. For me learning should be fun and in particular learning a language. I currently have a French teacher back home who is fun and casual in her approach with me; Marion was exactly the same for me which was fantastic. The moment I arrived I had some reservations about my ability to be completely immersed in French, but how wrong could one be. Marion and her Mum Nicole made me feel at ease from the beginning, such that as the days went by I was completely relaxed about the experience. The week exceeded my expectations by far, as well as the fun lessons, most of which were spent walking through the most beautiful countryside whilst exercising my brain with words games and conversation: I had total immersion from breakfast through to bedtime. My ability to understand spoken French improved immensely with the help of Marion recognising my ability and developing my ears and confidence. On the last evening I even attended a local amateur dramatics production of Little Red Riding Hood! Admittedly I did not understand all, but a fair amount. This is something I would not have imagined doing before. One excursion I would highly recommend is the trip I made to the medieval city of Perouges. We had beautiful weather so we could walk around the city and really take in its charm. Marion and I even stopped in a quaint bar for a refreshing artisanal beer, another part of Marion’s relaxed approach that I loved. I was sad to leave because Marion and Nicole made me feel like part of the family and I knew I would miss the conversations in French. To summarise, I now feel I am to more confident and realise that I can communicate in French! It made me realise that this is such the best way to learn French, so much so I will doing further immersions, perhaps with Marion and Nicole again to hopefully demonstrate my progress and to learn more. If you want to improve your French and experience the culture and beauty of Beaujolais, then I highly recommend this week. Thank you Marion and Nicole. Thank you for a wonderful 2 weeks’ French immersion, Marion. You made me feel so welcome and really introduced me to life in your beautiful village surrounded by vineyards. 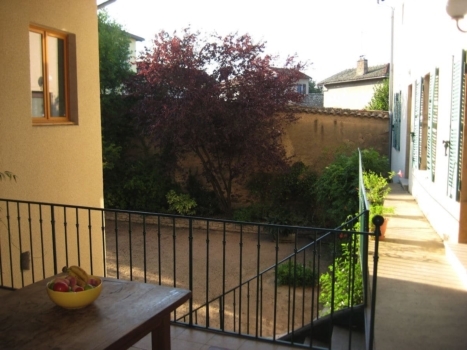 I loved chatting in French over our breakfasts and dinners on the terrace and when the weather was really hot, our French lessons in the swimming pool were just perfect! 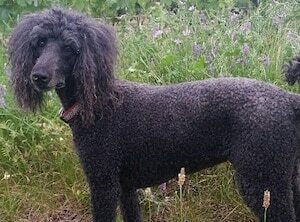 And Matty loved our walks along the Saone and pottering through the vineyards. Here’s a pic of her in the garden with your football. We both felt like part of the family while we were with you – thank you for everything! I’ve been determined to perfect my French since visiting Paris last summer for the first time in many years. Since then, I’ve been working steadily on my own and speaking regularly with native speakers on Skype. 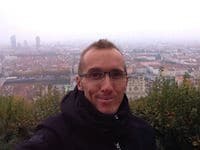 Last fall, I came across the French immersion opportunities on the French Today site and thought this would be a great way to get to the next level while experiencing another part of France and a taste of life with a French family. I wasted no time booking my stay with Marion and was very much looking forward to the experience. It did not disappoint. I felt at ease with Marion from the moment we met at the train station. As a teacher, she is very knowledgeable and supportive. Her explanations of various points and responses to my questions were very clear and helpful. I enjoyed our morning walks in the beautiful countryside, during which we discussed a wide range of interesting topics. I had fun learning new vocabulary while we played the French version of the game Taboo, among other games. I plan to take the DALF C1 exam just for the challenge, so we worked on some exam exercises and Marion gave me numerous tips on how to succeed. The accommodations were excellent and the atmosphere was very relaxed. Marion’s mother Nicole and her brother Lambert were very friendly and welcoming. 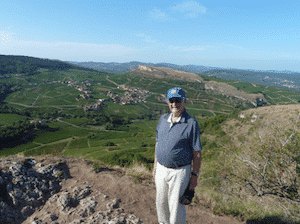 The town and surrounding area are beautiful and I enjoyed our visits to Lyon and the “Solutré” rock. The week went by much too fast and I was very sad to leave. I even offered to move in with the chickens if they would let me stay! I hope to go back for another stay in the future. What Marion did quite brilliantly was take us forward in not feeling too self-conscious about speaking French out loud to others; in other words, not just to her as our teacher. Learning a language from the A1 level takes guts and Marion helped us feel more comfortable in the world of French speakers. Marion stresses the audio of learning French. She is keen to make your ears (or hearing aides, in our case) more sensitive to the sound of spoken French, i.e., recognizing what is being said, especially what is being said to you on the street. Added to her keen pedagogy is a skill to turn the learning into fun. Marion and her mother Nicole love board games, card games and word games. Who knew that you could strengthen your French by playing battleship? Marion is able to establish a good rapport and solid understanding of the individual student’s strengths and abilities and plays to them. But she does not sacrifice, in the fun of things, the primacy of striving to understand the spoken word. For me French language is first of all the pleasure of communication. If you feel the same way than you really should go for Marion’s course. I have spent two weeks at her hospitable home with her family. Also her friends were visiting, bringing their wonderful stories. French lessons were interesting, various, we played a lot of cool games that make the brain work. Now I’m a fan of “Taboo” and “Debates”. Also every day we’ve spent part of lesson time in open air walking in vineyards and other beautiful places (there a lot of those!). I felt as a part of a family and it was amazing. I am very grateful to Marion, Nicole and Lambert. I would come back with pleasure. Therefore, if you want to do something what better time than now? 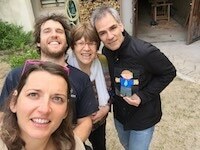 That is how I ended up booking a one week stay with Marion and her wonderful family in Beaujolais to improve my french speaking: and what a fantastic week it was. All of the other reviews describe beautifully what you would expect to experience in Beaujolais but a written review can not do adequate justice in conveying just how warm and welcoming the family are to a stranger keen to master a new language. My confidence in speaking increased 10-fold and if i could, I would return every year. If possible, book to go in the spring or summer to benefit from the lovely countryside walks through the vineyards, by far my favourite part of the stay. I have become a firm francophile. Great praise indeed from a born and bred London resident. I highly recommend doing a period of immersion with Marion. In addition to being a skilled and patient teacher, Marion’s supportive approach makes it easy to work at speaking even at a beginning level. She adapted her lessons quickly to focus on the aspects I was most struggling with, and varied the class time with exercises, videos, and games. Of course, the meal times and excursions are very important aspects of the learning experience, and a key reason an immersion approach is so effective. She and her family are extremely welcoming, making the entire experience very comfortable and fun. The whole family was very patient and forgiving as I struggled to express myself in a new language, and by the end of my time things were moving much more fluidly. I not only learned a great deal of French, but also a great deal about the Beaujolais, cooking, and of course wine. 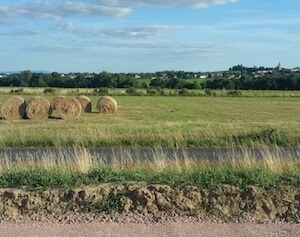 Outings to Lyon, to vineyards, and to see the countryside rounded out a great experience. My time absolutely flew by, and I look forward to continuing my language-learning adventure. How could I describe to you, potential future student, the time I spent with Marion? From the beginning I felt very comfortable with her. She encouraged me to speak in French as much as I could (my level was very low when I arrived) and thanks to her patience, my confidence and ability improved a lot during the week. 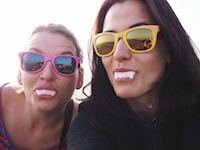 Learning French was not the only activity I enjoyed during my immersion week with Marion. Being located in the world renowned Beaujolais wine growing region I had the opportunity to tour the vineyards, to meet the “vignerons” who are passionate about their work and tasted some really good wine, even if I’m not a connoisseur, it was very interesting. We also had the opportunity to visit Lyon together; my favorite part was la Confluence with its new modern neighborhood. 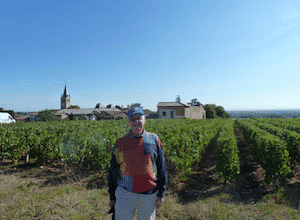 Something I was not aware of until I arrived is that Marion is a keen runner, and as I also enjoy running – we went out for an hour each day running amongst the vineyards – with the autumn leaves on the vines and fresh morning air it was just fabulous. I spent the week learning, talking, laughing, exploring – such a wonderful experience. In a word, don’t hesitate!